I want to thank everyone for being patient with me – as you might have noticed, I haven’t being posting as much as I would like. The book tour for Lost Cleveland has been outstanding. With less than 111 first run copies left, I suspect this is an unqualified success. But the truth is I need to get back to blogging about the great and cool history of Cleveland. One of the things I find so fascinating that Cleveland is that it had so many world-famous hotels. I mean this town rocked back in the day (still does, but fifty years ago the City was twice the size in terms of population). The Statler Hotel holds a special place in my heart only because I get to see it nearly everyday as it is close to where I work and play in Downtown Cleveland. . But it also holds a very neat history. 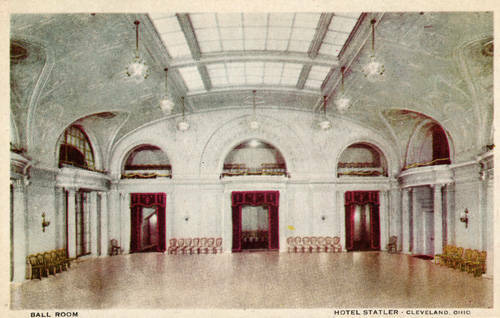 The Statler Hotel opened in Cleveland in October of 1912. Originally, the Hotel had 700 rooms which were later expanded to 1,000 rooms. 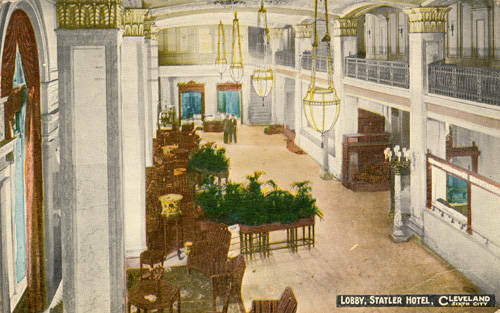 The Statler Hotel was actually part of one of America’s first hotel chains owned by E.M. Statler. 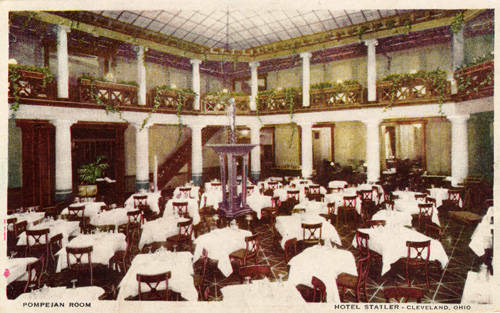 The original Statler Hotel was built in Buffalo, NY in 1907. 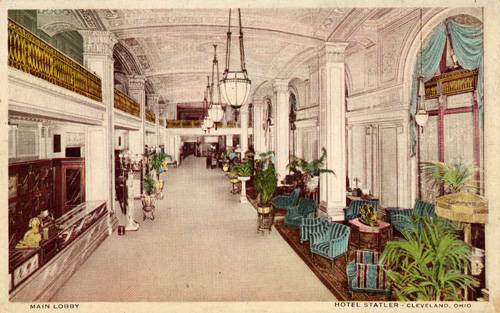 The Buffalo version of the Statler had a number of innovations that the Cleveland Hotel later improved upon including – a bathroom in every room, a light in the closet, and offering free stationary and pens (with the Statler logo of course) to every visitor. Tame innovations by today’s standards, but revolutionary at the time. The real innovation was the cost per room – $1.50 a night – E.M. Statler was expert in bringing refinement and prestige to the middle-class of America. 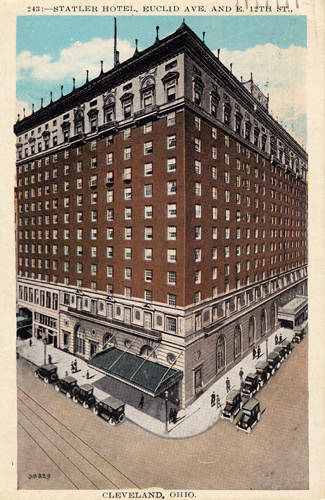 The Cleveland Hotel was followed by others built under the Statler name in Washington D.C., Detroit, St. Louis, New York, Hartford, Dallas and Los Angeles. Truly the first national hotel chain. The lobby of the hotel was a real gem. If you were to walk through the Statler today you would not be able to see the mezzanine area that was so eloquently open to the lobby. Here is another angle of the grand lobby area. Where did our elegance go, Cleveland? 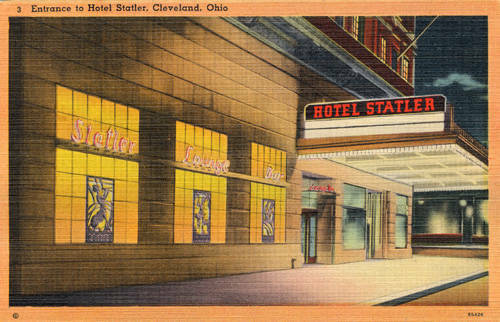 In 1954, the Hilton Chain acquired the Statler Hotels – and many considered the Cleveland hotel to be the crown jewel. Who woundn’t – it was a gorgeous hotel. In early 1971 new owners decided to make part of the facility office space and the building was renamed the Cleveland Plaza. Cleveland developer Carl Milstein purchased the building in 1980 and completed the conversion of the hotel property to all office. A famous Swingos restaurant was built on the first floor (parts of it are still there). In 2001, the storied property again went through a conversion this time from office to apartments and it remains so to this day. Michael thank you so much for printing this! I live at the Statler Arms and have been incredibly intrigued about the history of the building for the past 4 years. I so wish I could have seen this place in it’s original glory. Any further info that you have about the Statler, I would LOVE to have. PLease advise if there’s a place where I can get further information and pictures. Thanks again for printing this! I used to work in the building. You should see some of the renovations that it has undertaken recently. Quite a disappointment to what used to be there. The ballroom was gutted (last time I as up there was around 2005), but I doubt they’ve done anything more with it. The lobby is just 1 story now and they created offices and apartments on the recreated 2nd floor. The building needs to find solid business/retail tenants for the 1st floor and Mezzanine level (where the ball room is located) and that needs to be refurbished. I may have some connections down there still if you ever want to take a walk through there. Let me know. I would love to take a tour of the building if you still have some connections in Cleveland. Mr. Statler was my relative. This building is part of my family’s history. Michael, I am interested in knowing when you worked there because I understand that my dad who I never met worked their and I am trying to track him down. I heard that he worked at the hotel in the 50s. I actually found an ashtray (I think) from the Hotel Statler in my home today. I came across this blog when I googled it. That is quite a find. Statler was an amazing hotel. Thanks for your post. My grandfather worked there as a bellman, and I was enjoying pictures of my father and my uncle enjoying a Christmas party as kids in the early 50’s. My father worked at the Statler Hilton I know for sure in the 1960’s maybe in the 50’s too. I have a caricature painting of 10 employees, painted in 1969 by a man named Steve Cabak, not sure if Steve was an employee or not I know two of the people in the picture (my dad and my cousin) my dad was a bartender there. I actually work in the building now and I have seen the Terrace Room, and you can still see the original painted script that they used. They still have old dishes and chinaware in the old kitchen on the Mezz level, it is kinda of creepy like something right out of the Titanic! Thank you for this research. I was thrilled to find it. My father, Ray McSoley, was general manager there from 1943 to 1958, and that building was my home during those years. the hotel was a source of great pride to my dad and, I believe, the entire staff, and so was Cleveland. My grandfather was a chef at the Statler in the early 1930’s. A Cleveland paper did a small write up on him cause he was a chef and a lightweight boxer. I have a copy of the article which is pretty cool. Any chance of getting a copy of that article? My Polish immigrant grandparents met at the Statler. She was a chambermaid and he worked in the kitchen. They married in 1916 when she was 20 and he was 21. Loved finding this post with the history and photos! My Polish immigrant grandparents met at the Statler. Rose was a chambermaid and Joe worked in the kitchen. They married in 1916 and went on to have nine children. So glad to have run across this post! King of England ( Duke of Windsor and Wallace Simpson ) stayed at the Statler in 1950. Dorothy Fuldheim interviewed them in their room. Anyone know which room ? Thank you so much for your blog and the pictures of the hotel you included. I was just reading some family history that my great great grandparents had visited the hotel and someone had had a birthday. To commemorate the event, the hotel owner scooped up the silverware on the table, had it washed, and brought it back to them as a souvenir. How wonderful to be able to see pictures of that place even today, and imagine what a treat that must have been for them. We still have some of that silverware today.